Entertainment comes in innumerable forms that suit each individual’s hobby and personal preference, even the most demanding ones. Some people are privileged enough to enjoy skiing while others from tropical areas have never understood what it means to play with the snow. Today’s number is about Seoul in Korea, and the top ski resorts for visitors to visit. In Korea, especially in Seoul where mountain accounts for a large area of landscape, the freezing weather brings huge gifts from the Mother Nature: the landscape and snow. When it comes to winter, Western regions usually come to mind, but their Korean counterparts can be pretty harsh as well, since the temperature drops surprisingly lower than what we may think. This, however, paves the way for a variety of activities that could never be found in other areas: iced fishing, eating winter street food, outdoor ice skating, etc. In this article, I would like to focus on skiing, the most well-known and desired activity for anyone who’s never had first-hand experience in this. Browsing or searching for the right ski resorts can be pretty exhausting, which leads to this article where I would like introduce my list of top five skiing resorts in Korea. Arguably the most famous and biggest skiing resorts in Korea, The Yongpyong resort caters to all skiers, ranging from beginner to expert skiers. The Yongpyong resort is credited for being the very first modern ski resort in Korea, tracing all the way back to 1975 when Korea started its economic transformation. Since then, it has elevated itself to suit both domestic and foreign customers by enlarging the landscape annually. The result being that it now is home to some of the biggest slopes in South Korea: Rainbow, Gold and Mega Green. When it comes to finding ski tour, Yongpyong always tops the list. The most ideal time to visit the resort is around November to late April, when the weather is still cold and freezing. If you ever wish to add a little bit of skiing proficiency to your skills, this resort has hosted the men’s World Cup events in 4 occasions, the 1999 Asian Winter Games, and the latest 2018 Winter Olympics and Paralympics. Such a profile has proven the resort’s credibility when it comes to learning skiing from a technical aspect; you can surely meet many experts in the field there. Over the years, Yongpyong has improved its facilities to give customers plenty of things to do during their stay. A number of additions to its infrastructure have been made, ranging from Golf club, restaurant, to PC room and Karaoke room. Entertainment is also a big part of your visit after working out in slopes, and The Yongpyong resort definitely assists you with this better than anyone. 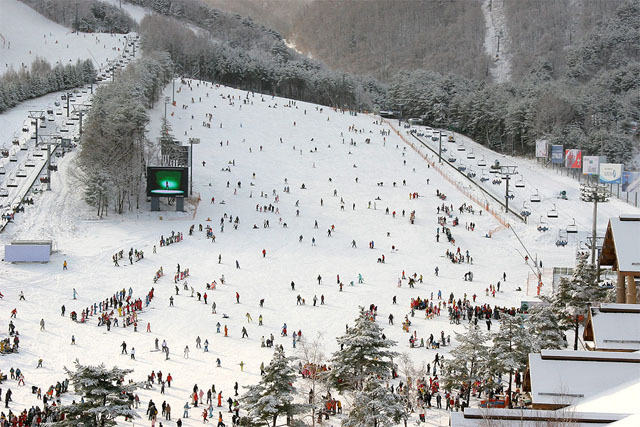 Take the one day private ski tour to Yongpyong Ski Resort from Seoul for a perfect ski tour during winter. For someone who does not have the faintest idea what skiing is, this place is the best choice. Aimed at basic skiers, this resort is open to whoever has a strong interest in learning how to ski, even though this place might be a little bit boring for experts. Still, this place is worth a visit. If you question its credibility, this resort was voted “The most ideal tourist attraction” by the Times in 2018. If you’re looking to try out skiing for the first time, Jisan resort should never be missed out on your considerations for ski tour. To reach the resort, either bus or car is accessible, though it is more advisable to get in by car if you wish to save your time. Taking a bus there may take around an hour and a half while you only need to wait for about 40 minutes to reach the destination. There are three meeting points: Hongik University Station, Myeongdong Station, and Dongdaemun History and Cultural Park Station. Beside the main purpose of serving customers who are interested in skiing, the resort is also equipped with a lot of wonderful facilities to boost customers’ ultimate experience. Some of the facilities are: The stage, The hall, The Supermarket Korean/Western Restaurant, Parking lot Camp fire, Outdoor and so on. You might be little bit surprised when you find out that the Daemyung Vivaldi Park has been on a 7-year run for being the most visited resort in Korea. This, in fact, comes with very little surprise when the resort is backed up by some of the most state-of-the-art facilities and slopes, in a way that every customer from every level can enjoy. Moreover, newer and upgraded facilities are added every year, all to maintain its reputation of being one of the best ski resorts in Korea. Within only 45-60 minutes’ drive from Seoul, this resort is probably the closest to Seoul, making it more convenient for foreign visitors after feeling tired from their flights to Korea. Once they arrive at the pick-up point, a bus will take them back to the resort and start their wonderful visit there, an experience that they will never forget. With a total length of 6,784m and an area of 1,322,021m2, this world-class resort for skiing can accommodate up to 20,000 visitors on a daily basis, so there’s no need to be worried about not having available rooms for you or your family. By tour: This Daemyung Vivaldi Ski Park private tour will make your ski tour more pleasant. Unlike other resorts, you’re not going to take a bus or a car to get to the resort; you use a train instead. As a native Korean, this might not seem interesting at all; they’re probably too used to seeing a subway train. For a foreigner, like me for example, I’m more than thrilled to experience using a subway train for the first time. It is this little thing that helps to build up my excitement during my visit at the resort; having a fresh start from the beginning to the end of the tour. Some families have a hard time choosing where to stay due to conflicts in interest; parents want to relax while kids want to be active all the time. If you wish to let your kids hang around until they’re tired while you’re chilling and immersing yourself with natural scenery, this resort is the ultimate choice for you. With a lot of lessons and courses in skiing available, your kids can get some eye-opening lessons from instructors, who are experts in skiing, and some quality time between you and your romantic partner is free. Beside the main activities in skiing, the resort also highly values other services. Notable facilities and services included are golf, restaurants, banquets, and most surprisingly, wedding ceremony. Proposing to your partner in a place like this has never occured to you right? You might give her or him the best wedding party that a person could ever dream of. The slopes, like usual, come in different sizes and heights, catering for any level skier. Nevertheless, a Gangchon Elysian Ski tour will be a highlight of your trip during winter in Seoul. If you’re down for the biggest “local” hill near Seoul, you cannot find this anywhere other than this Bears Town Ski Resort. Very suitable for ski learners up to intermediate level, this resort is very unique in its combination of modern facilities and natural wilderness. For children, this ski resort is safe because skiing must be in order, so parents can freely explore skiing with their kids. The time here is very flexible – probably the most flexible, as it is open from 9 am – 4 am the next day. You can ski anytime you wish, but it is more advisable to ski during the day for safety reasons. 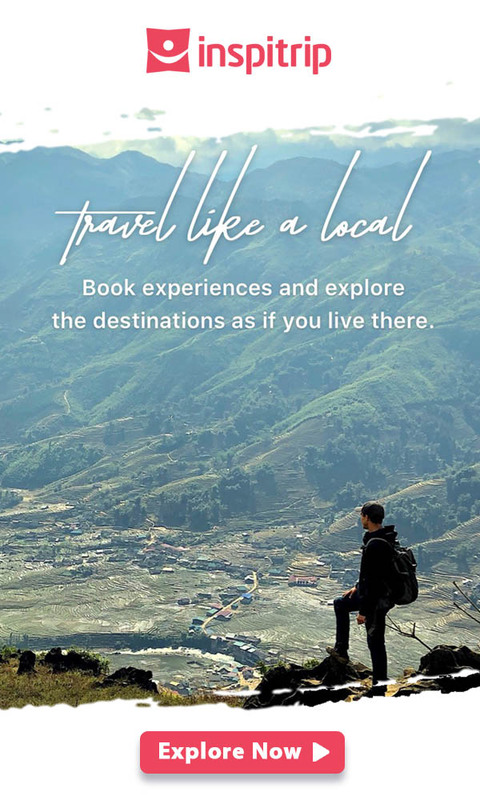 For accommodation, Airbnb is quite popular among visitors here. Airbnb, like usual, is convenient when you can do things on your own since it is already arranged and set up by hosts. Underfloor heating and excellent internet connection are popular accommodations, so don’t worry about the cold at night or a lack of access to the outside world! In order to reach Bears Town Ski Resorts, taking a shuttle bus is your best bet. Unlike other resorts, a shuttle bus for this resort actually costs a bit of money at around 9 or 10 dollars, and it can take from 50 minutes to 2 hours to get there, depending on weather conditions and traffic. You should always be on time if you want to enjoy every bit of your travel here. It’s advisable to bring your own coats and winter clothes. However, you can make your own purchases in the resort if you wish. Should you have children with you, always be careful. The resort is crowded with a lot of visitors. To ensure that you and your family have a place at the resort, please make your reservation in advance at least 7 days. It would be more convenient to choose your preferred rooms.